Sciblogs | Could Wellington be Next? Over the past three days, earthquakes have been rattling central New Zealand, with the epicentres of many of the tremors between Seddon and Wellington. According to GNS, the largest earthquake had a magnitude of 6.5, and was located beneath Cook Strait at a depth of 17 km, some 55 km from Wellington, and 45 km from Blenheim. There have been several dozen significant aftershocks, leaving some residents fearing that the recent seismic activity could be a precursor to a much larger earthquake in central New Zealand. Normally, when seismologists talk about a future earthquake in Wellington, they tend to focus on the closest active faults (i.e. 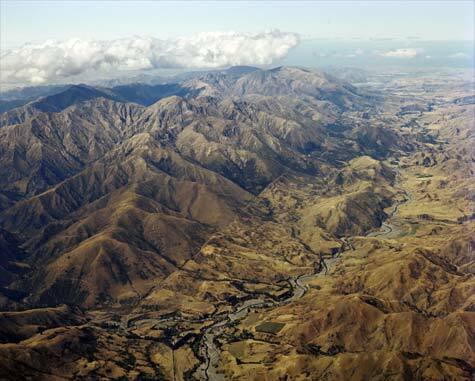 the Wellington or Wairarapa faults). 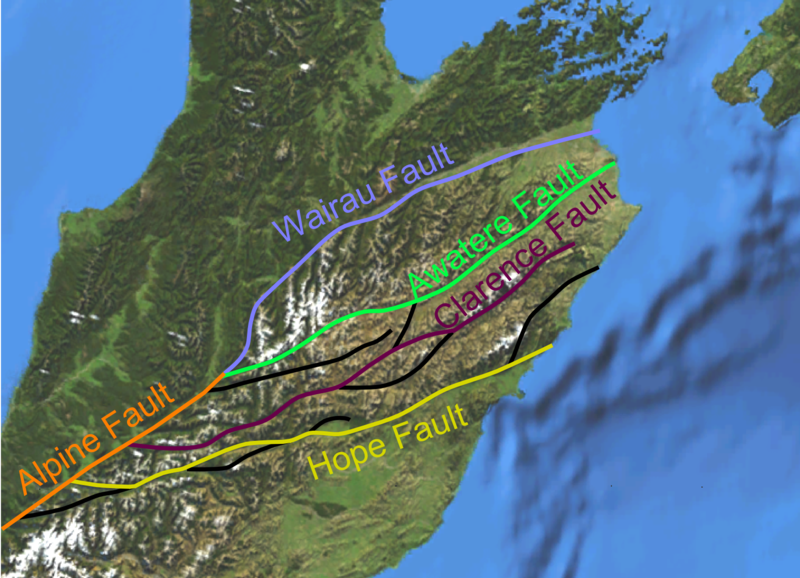 However, to the south of Cook Strait (and probably at least partially crossing it) there are also several major active faults, including the Hope, Clarence, Awatere and Wairau faults of the Marlborough Fault System. 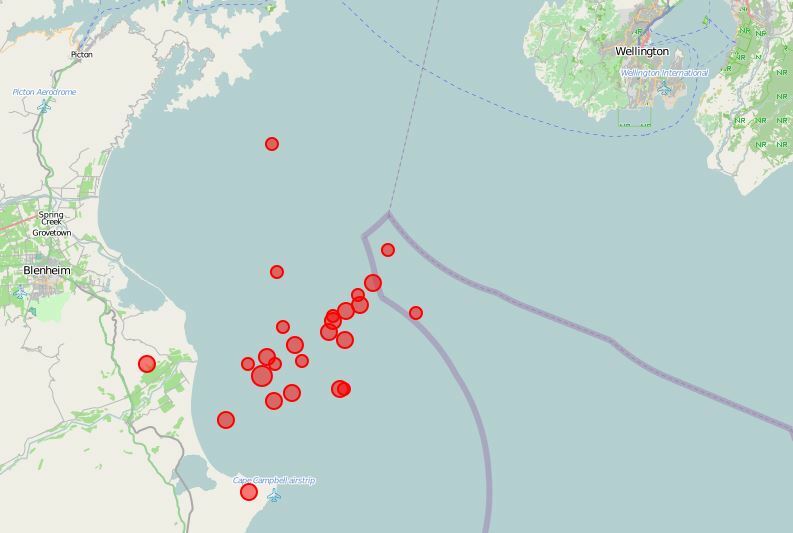 Much of the recent seismic activity beneath Cook Strait appears to converge directly offshore of the Awatere Valley. The Awatere fault is a major active strike-slip fault which last ruptured in 1848, producing an earthquake of around Mw7.5. That event caused three fatalities and widespread damage in Wellington, which would have been subjected to shaking intensities of up to MM8 (see here for a description of MM shaking intensities). Awatere valley. The linear trace of the Awatere fault is clearly visible on the left side of the valley. As a result of the recent swarm of earthquakes, some damage has been confirmed in the capital city, with reports of brick facades crumbling, sink holes opening up in the CBD, and goods falling off of supermarket shelves. Thankfully, there are no reports of serious injuries or deaths (at least not yet). While some earthquake-hardened Christchurch residents may raise an eyebrow at all the commotion caused by a M 6.5 earthquake centered 50 km out at sea, residents of central New Zealand could be counting their lucky stars; a similar magnitude quake under an urban area could cause massive damage (particularly in Wellington’s CBD). There have been 117 Mw6-7 earthquakes in New Zealand since 1960 (or about 2 per year), and Mw7-8 earthquakes occur about once per 2.5 years, so residents should also be prepared for a more powerful earthquake. Historical records show that larger earthquakes (Mw7-8) occur about once for every five earthquakes of Mw6-7 in New Zealand. So while the recent seismic activity beneath Cook Strait is unlikely to be a precursor to a larger event, that possibility certainly can’t be ruled out yet.